1968 Track on Echo Summit. Photo by Pacific Association. 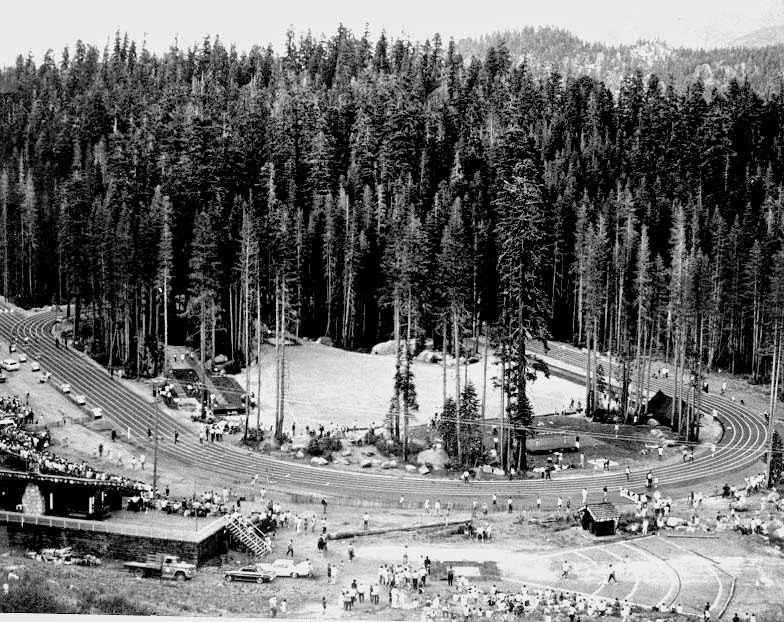 Many people don’t know that Echo Summit was the site of the 1968 Olympic Men’s Track and Field Trials. The U.S. Olympic Committee chose Echo Summit as the ideal site because the altitude is within 28 feet of Mexico City where the Olympics would be contested. Athletes from the 1968 Olympics will be speaking at the old Track and Field site on Friday, June 27, 2014. The event is called “Return to the Summit” in celebration of the 1968 Field Trials and to place an historical marker on the site by El Dorado National Forest officials. A roadside sign on Highway 50 will be placed as well. Echo Summit served as a high-altitude training camp as well as the Track and Field Trials. A temporary Tartan track was constructed in the forest. Trees were left standing in the middle of the distinctive 400-meter track that had 8 lanes on the straightaway and 6 lanes on the curves. The track was disassembled and moved to South Tahoe Intermediate School, where it lasted until 1992. Four world records were broken at the Echo Summit facility in 1968. The team selected at Echo Summit was arguably the strongest in Olympic history, winning 12 gold medals in Mexico City. The event will begin at 10:30am, at Adventure Mountain snow park off Highway 50.